Food was bland at best. Fortune cookies were stale. Sesame Chicken and Sweet and sour chicken was rubbery. Cream cheese wontons lacked cream cheese and were also rubbery. Im afraid we will not be coming back..
Fred rice and shrimp, meant not much shrimp and not much flavor. Also had a chicken dish with no flavor. Should have known when I went in to get the order the place was empty. The cheese puff was not a puff, but tough! They have a large menu with a number of duck options. The crispy duck noodle soup is my personal favorite. My wife loves the green beans with spicy meat sauce. My favorites are the Fried Rice, it's good because they don't over cook the vegetables, and the Egg Foo Young is made really well. Plenty of free parking. Attractive but dark ambiance. Friendly and attentive staff. Limited food selections. No fresh fruit. Chicken wings and chicken satay were OK, but dry. Would not be my first choice for an Asian lunch buffet in the future. 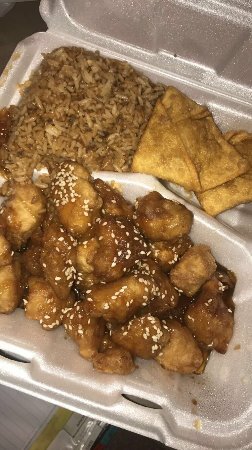 A Shoreview Staple for Chinese! Get quick answers from Wok Cuisine staff and past visitors.